What do you get when you combine the old religious concept of the seven deadly sins, magic, and the Arthurian legends? The short answer: a captivating, innovative twist to shounen anime that is both exciting and nostalgic. Nanatsu no Taizai (The Seven Deadly Sins) tells a familiar story about knights protecting a princess while fighting evil — but not without creating a brand new experience full of complex characters that bring out the anime’s excellence. Now here’s the long answer. In these episodes, Nanatsu no Taizai lays the foundations of a good story with a hook that left me full of curiosity. Right from the beginning, I was presented with scenes of a decimated capital city and dozens of murdered Holy Knights, each one said to be as strong as a country. It made me wonder what kind of monsters these Seven Deadly Sins are to have caused so much destruction. I soon find out that the second sin — The Serpent’s Sin of Envy — is named Diane who is a giant. The introduction of the sins amplified my interest by suggesting that not all of them are human. What else could they be and what kind of powers do they have? With these questions in mind, I couldn’t help but continue to watch in search of the answers. My curiosity was marred, however, by a shaky start to the story that contributed to a sense of randomness and lack of clarity. The pacing of the story was very fast, leaving out a lot of important details that could have added depth and coherence to the plot. For example, the anime rushes through introductions, with two of the Seven Deadly Sins already found at the start of the show and the whereabouts of another two are identified by episode three. Due to this, a lot of characters were presented with little to no development. 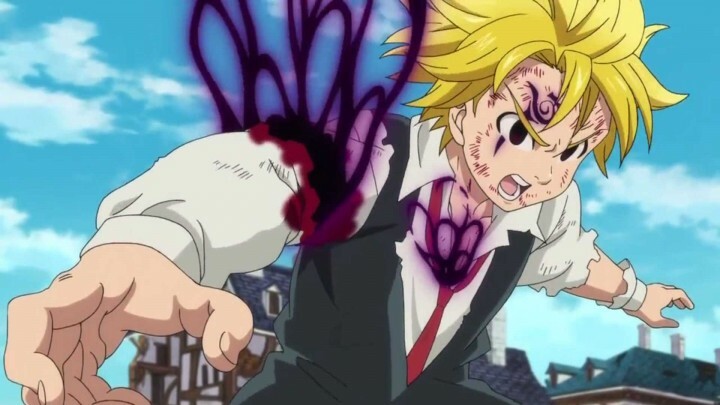 I knew nothing more about the main protagonist — The Dragon’s Sin of Wrath, Meliodas — at the end of episode six than I did in episode one both in terms of his personality and his background. But what made me cringe the most was how overpowering the characters’ strengths were. Gilthunder dried out a whole river by simply sticking his sword in the ground. 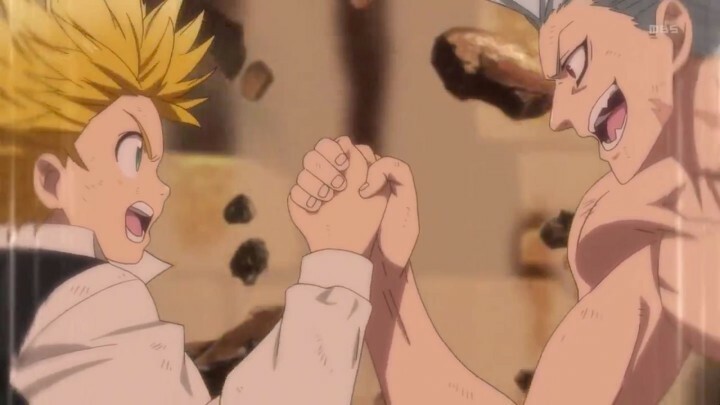 Even more ridiculously, Meliodas and The Fox’s Sin of Greed, Ban, destroyed a fortress and an “unbreakable” sealing spell as a side effect of their arm wrestling match. At this point, I found it hard to imagine any potential conflict — a fundamental element of storytelling. This, along with the shallowness of the characters, made me unsure that I’d enjoy the cast and confrontations of Nanatsu no Taizai. Unlike the first six episodes, these episodes focused more on characterization and framing the Sins’ powers. The Byzel Fight Festival gave a look at the extent of Ban, Diane, and Meliodas’ monstrous strength. 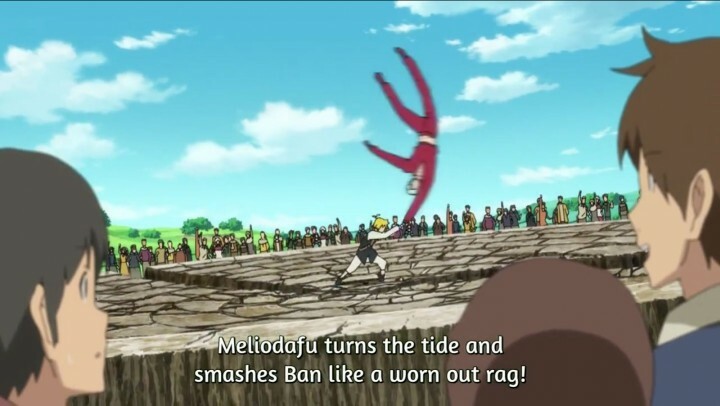 For example, Meliodas split the gigantic boulder under the fighting rink in half just from punching his opponent. Stronger opponents, like the elite tier Holy Knights, also allowed for a more comprehensive display of the Sins’ battle prowess. One of these Knights, Guila, easily defeats three of the Sins with magical power even greater than theirs combined. But The Bear’s Sin of Sloth, King, activates his sacred treasure that amplifies a Sin’s magical capabilities beyond their already overpowered state. At the same time, the characters became less one-dimensional as we were offered a look into their inner thoughts and emotions. Ban, who is a stereotypical drunk, was depicted as more than just a thug through his deep feelings for his deceased lover. The Sins were finally starting to transform into unique identities that made them complex and lovable. While these episodes excelled in character progression, the pacing seesawed into a slow crawl. The tempo was slowed down so much that the story itself seemed to come to a halt as evident through the Byzel Fight Festival. Almost everything that happened at Byzel was dismissed as unimportant by the Sins themselves and didn’t really advance the overall story. Even though these episodes were packed full of action and new characters, they contributed only minimally to the main plot: Princess Elizabeth’s quest to find all of the Seven Deadly Sins in order to save her country. 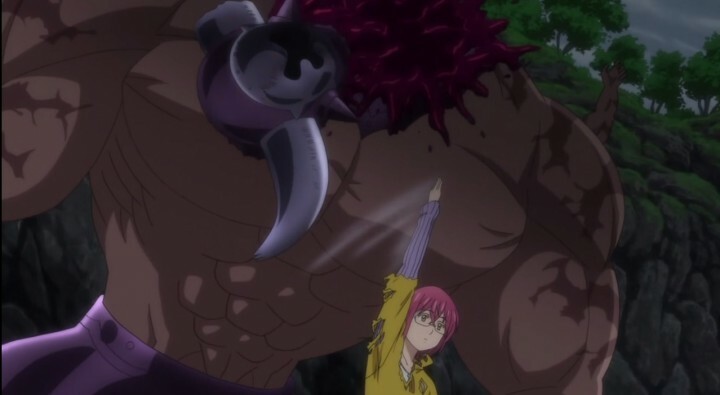 The choppiness of the storyline finally began to vanish as the plot moved forward by finally introducing the fifth Sin: The Goat’s Sin of Lust, Gowther. The journey was renewed as the Sins continue to search for the remaining two Sins. What really set these episodes apart from the previous ones was that they progressed the story not only by introducing another Sin, but also by tying together some loose strings. 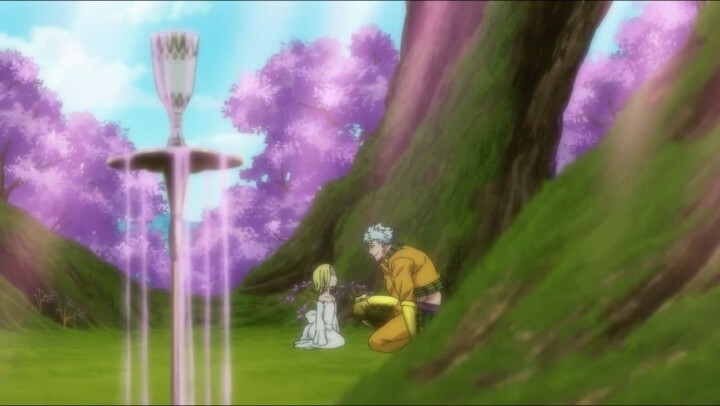 We finally find out why the Holy Knights wanted Meliodas’ sword. It was this revelation along with the kidnapping of the Princess that truly led the anime to a new stage. The story transitioned smoothly into the climax. The anime wasted a lot of time developing secondary characters. But some problems just kept coming back. As if the two cannot coexist, while the pacing picked up, key character development was neglected once again. Gowther remained a mystery — we don’t even know whether or not he’s human. Even though an entire episode was dedicated around Gowther, I felt like all it did was increase my confusion about this character. 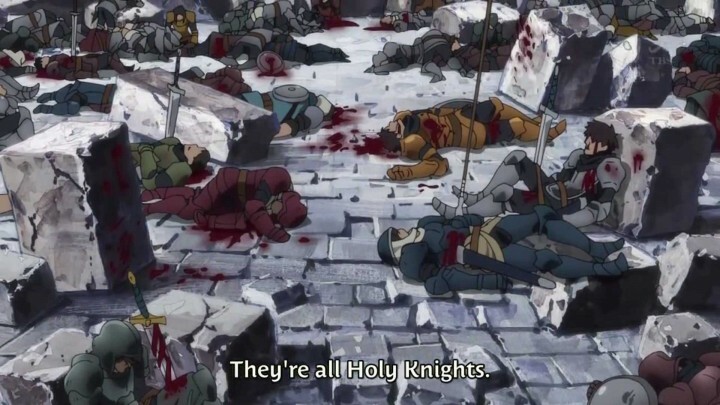 Instead of better defining the main characters, the anime wasted a lot of time developing secondary characters like Holy Knight Guila. While the Sins went to rescue the kidnapped Princess, the focus on Guila interrupted much of the tension and flow of events. This time could have been better used developing the Sins and Princess Elizabeth. In the end, a shounen anime is shounen after all. In these last few episodes, the various fights in the capital revealed more about the characters and the story than all of the past 17 episodes combined. Many flashbacks occurred during the fights, inviting us to take a look at not only the Sins’ pasts, but also the depth of their character complexities. The conflict King faced in his flashback between duty and love showed that he is not just a lazy fairy, but one with a sense of responsibility strong enough to sacrifice the things he cared for. It wraps up on an emotional high that brings a sense of completion to the story. Similarly, the fights also charged the story with emotion-filled scenes that brought a satisfying conclusion to it all. I felt a bittersweet feeling of fulfillment as King slowly turned his back on the body of the best friend he was forced to defeat. The final battle is won and the Sins set out on another journey with Elizabeth to find the last Sin, The Lion’s Sin of Pride. 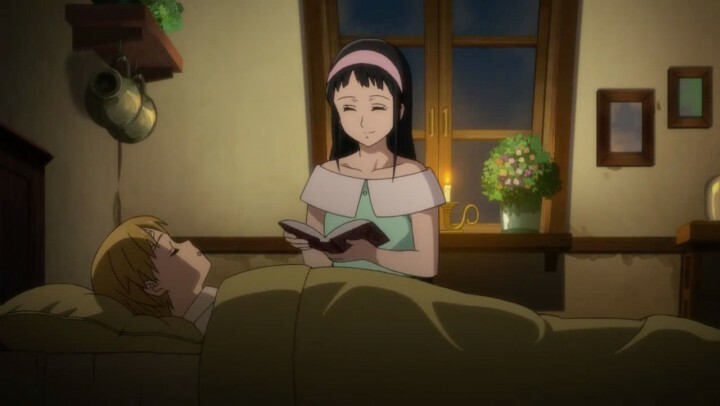 With the cliffhanger of discovering this Sin’s identity, Nanatsu no Taizai wraps up on an emotional high that brings a sense of completion to the story. Despite some setbacks in the beginning, Nanatsu no Taizai successfully presented a great embodiment of the fusion between classic themes and modern shounen storytelling. The classic medieval themes gave the story a feeling of familiarity that made it grounded. Dynamic, super powerful characters made fights riveting, accented by excellent animation. Once the anime started paying more attention to details in character development, Nanatsu no Taizai donned its own unique identity that sets it above other shounen anime.